Gelato is ice cream, yes, but made the Italian way. It’s slow-churned, creamier and intensely flavorful. It’s not easy to get it right. These nine restaurants and sweet shops have mastered the technique. One taste, and you might never eat regular ice cream again. The city’s summer heat is the perfect time for a cup of gelato and this is the place to cool off. Actually, the gelato is so tasty, it’s popular winter, spring and fall. You’ll find dozens of hand-crafted classic and unique flavors made on-site, served fresh daily. They offer weekly specials that highlight a rotating mix of one-of-a-kind flavors like green tea limoncello. An off-the-beaten-path jewel that serves handmade gelato, using fresh, local and organic ingre-dients (when available). 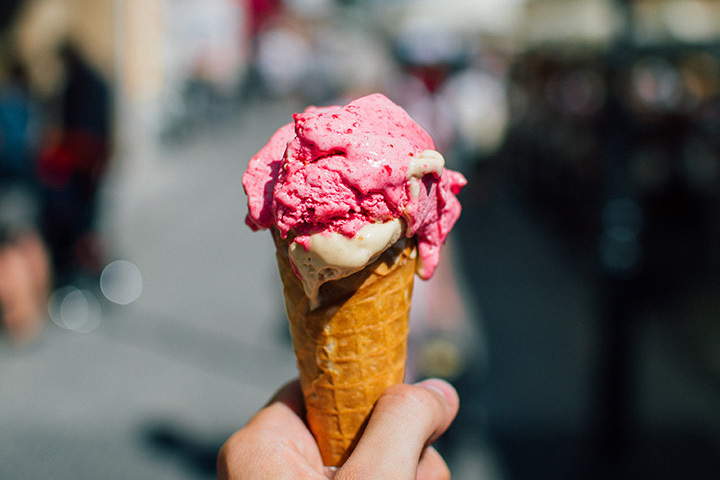 Gelato is made the old-school Italian way, churned slowly to give it an airy, lighter taste. Flavor choices change regularly so on any given day you might get coconut stracciatella, strawberry habanero, papaya with lime, blood orange or a dozen other options. A charming Italian cafe atmosphere where you can also get an espresso—organic fair trade beans of course. This is the jack-of-all-trades of coffee shops. You’ll find light breakfast fare, a sizable lunch menu, pastries, coffee drinks and homemade gelato! The flavors are as eclectic as this place— basil coconut with a splash of raspberry balsamic vinaigrette and toasted coconut and dark chocolate are two popular favorites. The selection is small but the tastes pack a wallop. Sit out on the back deck overlooking the Rio Ruidoso River and savor the moment. Cozy, warm, friendly, comfortable atmosphere, handmade gelato and a beautiful view of the Tu-larosa Basin and the Sacramento Mountains in the distance makes this an amazing spot to have a cup of brownie flavored gelato … or maybe mint chocolate chip … or chocolate hazelnut … or, well you get the idea. You’ll find a good selection of tempting gelato flavors in the cold case. Free Wi-Fi, great coffee in a casual atmosphere. The gelato here is artistry in a cup. It’s handmade fresh every day. No stabilizers, emulsifiers or preservatives are used. It’s all natural, made with hormone-free milk. The flavors are imaginative and intriguing and change regularly. Don’t miss this delicious treat at one of the few places in town that serves gelato. Vegan sorbettos with fresh fruit are also available. Italian cuisine is known for a few traditional foods … spaghetti, pizza and gelato! This family-friendly restaurant has been creating great Italian meals for 10 years and the kicker to every meal is the gelato. They offer free samples of all the handmade flavors, which change often. Choose from cherry cola, pumpkin pie, apple green chili, horchata, pomegranate, chocolate cof-fee and, well the list goes on and on. If you don’t save room for this sweet dessert after dinner, take a pint home and enjoy it later. Located in a completely refurbished and historic yellow-brick house, what began as a coffee shop has turned into a full-service restaurant, in large part to community demand. The food and atmosphere at breakfast, lunch and dinner is just that good. At the top of their list of quality fare is the handmade gelato. A cup of tiramisu or mango at the end of your meal is an experience you won’t soon forget. If you’re craving something sweet, this tiny cafe in the historic Taos plaza will satisfy that desire. The specialty here is handcrafted, small-batch, organic, bean-to-bar chocolates bars. The aroma of freshly roasted cacao beans is a tantalizing temptation that should be acted upon. The same artistry that goes into making artisan chocolates is applied to making their feathery light, velvety gelato. They use ingredients from their chocolate making to create sensations like matcha white chocolate nibs gelato. Your sweet tooth will thank you. Everything about this charming winery says Italy, from the traditional varietals like montepulci-ano to the San Marzano tomatoes on the pizza to the hand-made gelato. The gelato bar is ex-tensive with flavors that range from classic vanilla bean and salted caramel to the unusual like cucumber and birthday cake. All are served with an authentic Italian wafer cookie that bids you buon appetito.